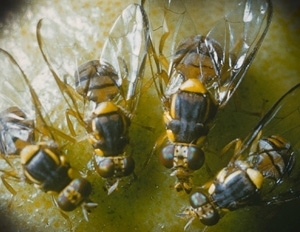 The Oriental fruit fly is an invasive insect pest that can cause devastation to several hundred crops, leading to serious crop and economic damage. Fresh fruit, vegetables and other plant material should not be moved from one's own property but should be consumed or prepared (cooked or processed) on site. Plant material is safe to eat and there is no concern about diseases or other contamination. While you might think, "well, I don't see any flies on my fruit", the eggs and larvae could be on or under the fruit or vegetable skin/peel and go unnoticed. Remember these are not the common fruit flies that you might find on overripe fruit in your kitchen. These flies are a little larger and feed on a wider range of healthy fruits and vegetables. If you live within the quarantine zone, please help limit the spread of this invasive and potentially damaging pest by not moving plant material off your property. If you have any questions, please call the CDFA pest hotline.